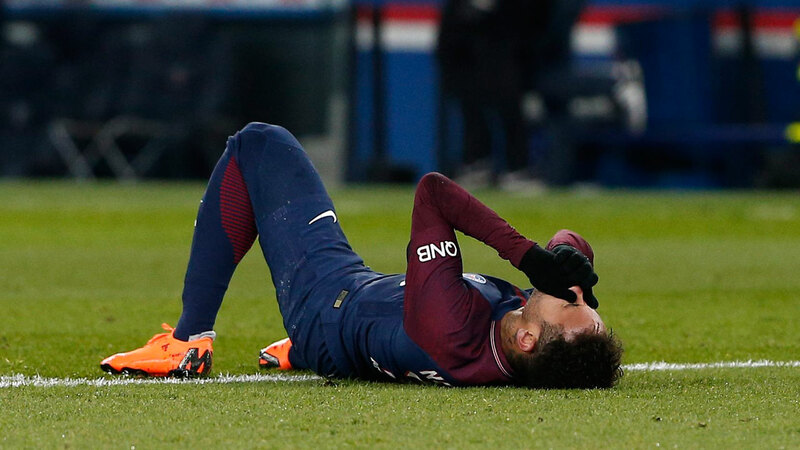 PARIS — Neymar went off on a stretcher after twisting his right ankle late in league leader Paris Saint-Germain’s 3-0 victory against Marseille on Sunday. The Brazil striker was taken off with 10 minutes remaining, after going in for a challenge on Marseille defender Bouna Sarr. PSG coach Unai Emery is hopeful that Neymar will recover in time for the Champions League game against Real Madrid on March 6. PSG trails 3-1 from the first leg in the last 16. "The first tests revealed a twist. We will do further tests," Emery said. "For the match against Real, if I had to say ‘yes or no’ right now, I’d say yes." Neymar had his head in his hands and appeared tearful as he was taken off. His standing leg jarred as he lost balance and the weight of his body went onto his ankle, which briefly buckled under him. "Of course I’m worried about Neymar," PSG goalkeeper Alphonse Areola said. "His ankle was quite swollen. He’s an important player for us and I hope he comes back quickly." PSG’s game against fierce rival Marseille was heated, especially in the second half, with cheap challenges from both teams and 11 yellow cards — six of them for the hosts. "We were solid and we tried to control the game," PSG captain Thiago Silva said. "It’s a shame that we lost an important player (Neymar) at the end." The win moved PSG 14 points clear of second-place Monaco, with only 11 games left. Marseille is two points further back in third. PSG’s first two goals stemmed from Marseille’s mistakes at the back. In the 10th minute, PSG right back Dani Alves’ pass behind the defence was easily read by left back Jordan Amavi. But rather than clearing the ball properly, his soft sliding tackle knocked it to Kylian Mbappe, who skipped past another defender before drilling a low shot into the bottom right corner. The second goal came from the other side, as midfielder Adrien Rabiot broke down the left and his cross found Neymar, whose side-footed pass was turned into his own net by centre half Jorge Rolando in the 28th. PSG’s third in the 56th owed nothing to fortune, as Cavani expertly controlled Neymar’s pass from the left with the inside of his foot, easily turned Rolando and smacked in a powerful shot past goalkeeper Yohann Pele for his league-leading 24th of the season. Mbappe shook his head disapprovingly when substituted, with winger Angel Di Maria replacing him for the last 30 minutes. Marseille threatened mainly from midfielder Dimitri Payet’s laser-like free kicks, but no one could get on the end of them. Lyon’s poor defending cost the team once again as right back Mathieu Debuchy scored a last-minute equalizer for local rival Saint-Etienne in a 1-1 draw. Debuchy, a recent signing from Premier League Arsenal, was left unmarked inside the penalty area to steer in a shot off the post from Remy Cabella’s left-wing cross. Lyon has only two points from the past five games — conceding 11 goals — and the club’s hopes of securing a top-three finish and a place in next season’s Champions League are fading fast. Fourth-place Lyon is five points behind third-place Marseille. A brilliantly executed goal from striker Mariano Diaz, his 15th of the season, gave Lyon a 19th-minute lead. He chested down a long pass from Brazilian defender Marcelo with his back to goal, flicked the ball around a defender with his right foot and then regained his balance before adroitly clipping it with his left past goalkeeper Stephane Ruffier. The two teams are bitter rivals with 17 league titles between them, including a French-record 10 for Saint-Etienne. But Lyon has been the superior team for many years, winning seven titles from 2002-08. Nice was reprieved by the woodwork four times in a 0-0 draw at Bordeaux. Bordeaux striker Nicolas De Preville hit the crossbar in the first half and in stoppage time. The post was also hit by midfielder Soualiho Meite in the 12th minute and centre half Paul Baysee in the 89th. Bordeaux is in eighth place and Nice remains ninth.